Fungal nail infection is an infection of the nails by a fungus also called onychomycosis. Distal and lateral margins of the nail are infected. Other less common patterns of involvement include white superficial onychomycosis and proximal subungual onychomycosis. According to a large North American Study by Columbia University College of Physicians and Surgeons, chronic fungal infection of the nail affects up to 14% of the population. Onycholysis (splitting of the nail plate from the nail bed) is the primary event. Initially there is a distal yellow or white patch of discoloration that extends and darkens with time, the nail becomes thickened and crumbly, and then splits. Toenail infection is more common than fingernail infection, and often all toenails become infected. Adjacent skin is usually infected and it can become a painful condition leading to functional impairment. It is generally difficult to treat and re-infection is common. 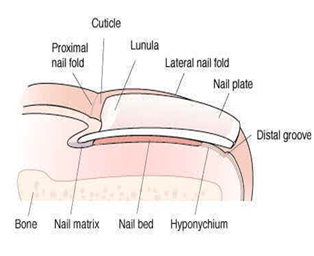 The toe nail is made up of several parts, each of which serves a specific function – the nail plate is the large, flat part of the nail; on the leading edge of the nail plate (the distal edge), where the underside of the plate attaches to the front of the toe is the Hyponychium. The nail bed lies under the nail plate, and at the rear of the nail you will find the lunula, which is the lighter crescent shape where the back of the nail joins the finger. This part is the cuticle, and as you trace the edge of the fingernail around the side the joining of nail and epidermis is called the lateral nail fold. Diseases that influence local and systemic immunity can predispose to onychomycosis, including diabetes mellitus, HIV, and peripheral ischemia. 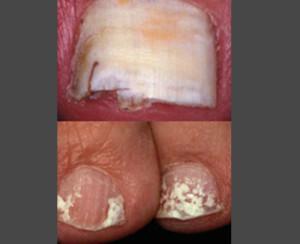 Infected nails also may separate from the nail bed, a condition called onycholysis. You may feel pain in your toes and detect a slightly foul odor. Your doctor will likely examine your nails first. To test for fungi, your doctor may scrape some debris from under your nail for analysis. Accurate diagnosis is sometimes difficult. Mycological examinations (direct microscopy and culture), the most commonly used diagnostic methods, have a false negative rate of approximately 30%. Histological analysis of periodic acid Schiff (PAS)-stained nail clippings significantly adds to the sensitivity of nail cultures. Other conditions, such as psoriasis, can mimic a fungal infection of the nail. Microorganisms, including yeast and bacteria, also can infect nails. Knowing the cause of your infection helps determine the best course of treatment. Nail fungus can be difficult to treat, and repeat infections are common. Over-the-counter antifungal nail creams and ointments are available, but they aren’t typically very effective. If you have athlete’s foot as well as nail fungus, you should treat the athlete’s foot with topical medication and keep your feet clean and dry. Antifungal lacquer: If you have a mild to moderate infection of nail fungus, your doctor may prefer to prescribe an antifungal nail polish called ciclopirox (Penlac). You paint it on your infected nails and surrounding skin once a day. After seven days, you wipe the piled-on layers clean with alcohol and begin fresh applications. Daily use of Penlac for about one year has been shown to help clear up some nail fungal infections. Topical medications: Your doctor may also opt for other topical antifungal medications. You may be advised to use these creams with an over-the-counter lotion containing urea to help speed up absorption. Topical medications usually don’t cure nail fungus, but they may be used with oral medications. Your doctor may file the surface of your nail (debridement) to lessen the amount of infected nail to treat and possibly make the topical medication more effective. Laser Treatment:Research suggests that fungi are sensitive to heat, typically 40-60°C. The basis of laser treatment is to try heat the nail bed to these temperatures in order to disrupt fungal growth. Surgery: If your nail infection is severe or extremely painful, your doctor may suggest removing your nail. A new nail will usually grow in its place, though it will come in slowly and may take as long as a year to grow back completely. Sometimes surgery is used in combination with ciclopirox to treat the nail bed. Wear appropriate socks. Synthetic socks that wick away moisture may keep your feet dryer than do cotton or wool socks. Change them often, especially if your feet sweat excessively. Take your shoes off occasionally during the day and after exercise. Alternate closed-toe shoes with open-toe shoes. If necessary a nail avulsion or matrixectomy is performed at the time of initial diagnosis and upon patient consent in our office. The procedure takes usually between 15 and 30 minutes. Explicit verbal and written post operative instructions will be given to patient upon completion of procedure. Patient returns to office one week after procedure for post operative follow up visit.